We’re still a few months from finally closing the books on a year wracked by natural disasters, but it seems safe to say 2017 will go down as the year of hellfire on Earth. Wildfires have lit up seemingly everywhere from California to British Columbia to Greenland (!). And then there’s Portugal. The country already suffered through deadly fires earlier this summer. But after its driest September ever recorded, persistent heat and winds from Hurricane Ophelia once again turned Portugal into a wasteland of burning forests and smoke that clogged the skies as far away as England. As of Wednesday, 1.3 million acres of Portugal have been scarred by fire this year. That’s 525% above normal for this time of year according to Bowen and equates to roughly 5% of the country. The recent round of wildfires have killed at least 39 in Portugal and neighboring Spain in what’s been the worst fire year since 2006 according to CNN. At least 62 died during the June wildfire outbreak in Portugal. It’s been a mix of natural fires lit by lightning and others started by humans, whether deliberately or inadvertently. The forests are filled with eucalyptus trees, which are highly flammable and prone to explosive wildfires. Those trees have been planted in the service of paper and pulp mills because they grow faster than native but less flammable pines and oaks. Only 3% of Portugal’s forests are managed by the government according to the New York Times, leaving vast swaths of land without any centralized management when it comes to fire prevention. It’s against this backdrop that climate conditions this year have primed the Iberian Peninsula to burn. Hot and dry weather has exacerbated fire conditions in the region all summer. 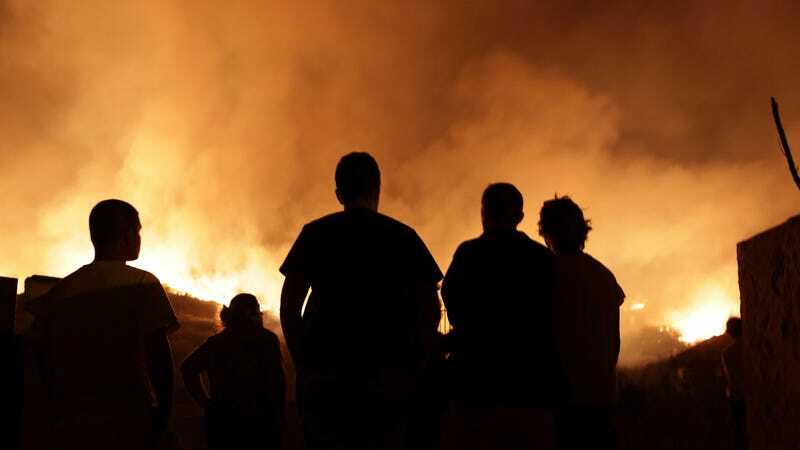 “This year has been particularly challenging for wildfires given Portugal has seen a severe lack of rainfall, with many areas recording less than half of typical rainfall in the past six months alone, and above average temperatures,” Bowen said. This past June was the hottest June on record for Portugal and Spain. Daytime highs were up to 7.2°F above normal. Other countries across southern Europe set temperature records throughout the summer and were also forced to cope with wildfires. An analysis conducted last month by Climate Central’s World Weather Attribution team found that this summer’s heat was made at least 10 times more likely by climate change. Hot weather dries out plants and trees, providing the fuel needed for massive blazes like the ones that have torn across Portugal this year. Rising temperatures aren’t just contributing to burning forests down. They also have the potential to completely wipe out the ecosystems across southern Europe. Depending on what grows back, the fires burning this year have the potential to speed the process along.